2013 duo performance • Matt Armistead (drums) and Josh Ronsen (guitar) at Club 1808. 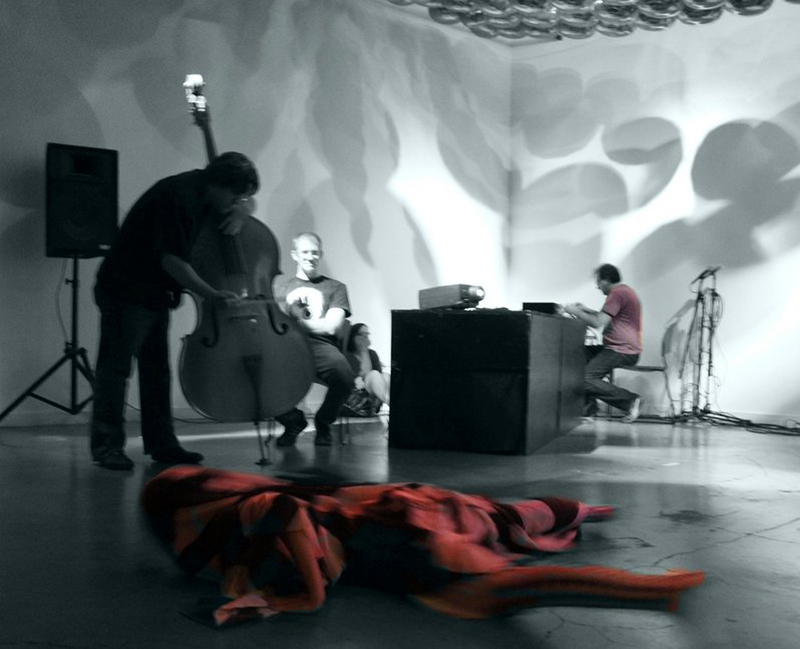 2011 SOUND CAVE intermedia performance at NMASS 2011 with Deena Odelle Hyatt, Brent Fariss, Bill Bridges. 2011 Text Video • study for larger project using text and video. Electronic music from Nord Electro 2 recording session. 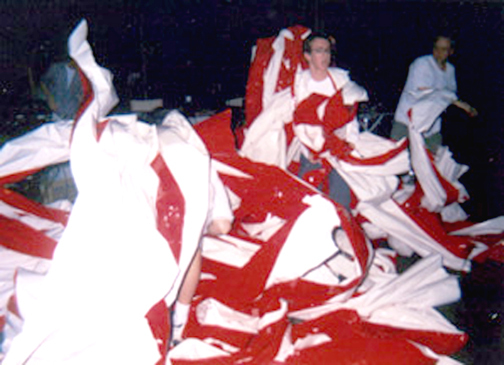 The best material can be heard on the brekekekexkoaxkoax Bandcamp site, including the albums Sudden Empire of Tears, The Doukipudonktian, and We Use To Be Such Good Friends. “Kokopelmana” • Moog synthesizer composition from 1995, released 2015 on Master Cactus #3 audio cassette magazine. Duo — Live at Red's Scoot Inn • 2006 performance with Jason Pierce (drums) and Josh Ronsen (guitar). “ZamZem” • electro-acoustic voice work on the Countdown 2012 Mail Art comp. “On a Lark” • minimal exploration of bird sounds for (CT) Collective comp. 1, 2, 3 & 4 samples of the track “Sorry!” performed by the Green/Nuckolls/Ronsen/Walsh quartet on Cohort Records. “R'shee'ma” • electro-acoustic collage work from recordings made by Genevieve Walsh (voice, drums), Glen Nuckolls (banjo), Jacob Green (percussion, electronics) and Josh Ronsen (guitar, voice, electronics). This was made for a compilation on the theme of lists. “Inadvertent Flying Saucer Attack Imitation” • While processing some rehearsal recordings that weren’t useful due to a buzz in the recording, an experiment through an echo developed this poor imitation of the psych-rock group Flying Saucer Attack. This is not meant as an insult, but as an homage. Performers were: Josh Ronsen (guitar, processing), Jacob Green (oboe), Bill Thompson (computer) and Vanessa Arn (electronics). “a.Lift” • collage piece on FLUXuations compilation. This contains about 400 sounds, can you name them all? “Music for Big Band” • 2003 Ilya Monosov composition with samples from Josh Ronsen and Bill Thompson. Notes. 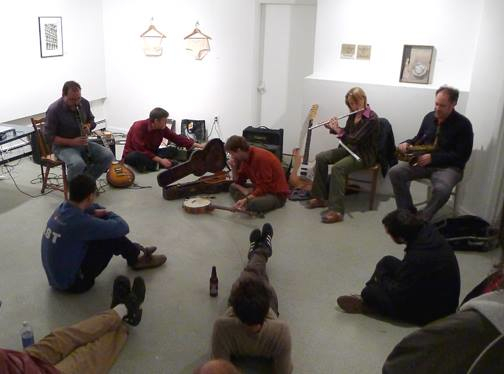 Glen Nuckolls (blue shirt), Josh Ronsen, Genevieve Walsh, Jacob Green & Mari Akita performing at End of an Ear records, 2006. Photo by Dan Plunkett. 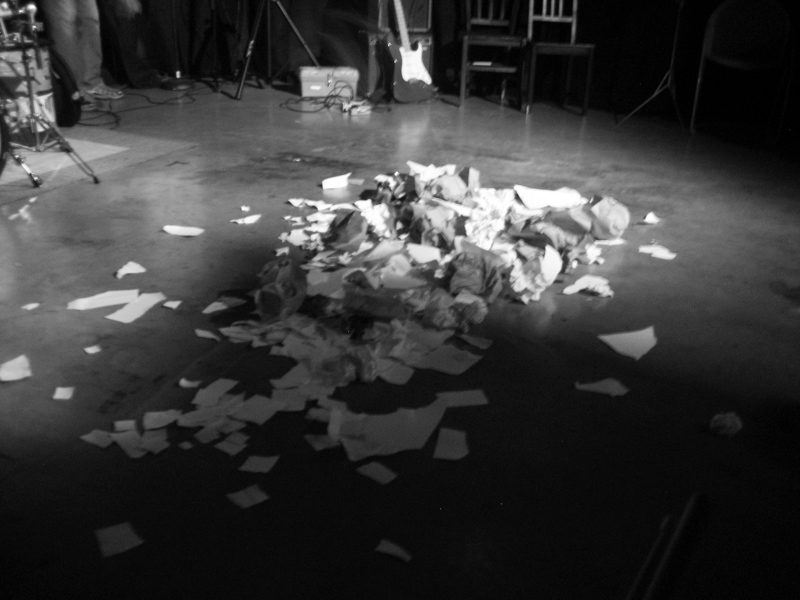 Aftermath of performance of Ben Patterson’s “Paper Piece” on November 23, 2008 with Josh Ronsen, Jacob Green, Mari Akita, Alex Keller and Greg Headley. Photo by niwi. Sound Cave performance @ NMASS 2011 with The Enforcer, Brent Fariss (contrabass), The Usher, Deena Odelle Hyatt (movement), The Helper, Bill Bridges (expert technical assistance) and The Mover, Josh Ronsen (design, sound, video). Photo by Nisa Asokan.